I always feel a little off balance this time of year. Thanksgiving weekend is over but I am not ready to jump into Christmas. I prefer to wait until 1 December to go all holiday. It is hard for me to let go of autumn, it is my favorite season. I love the angle of the light and the smells and the leaves. Christmas is a lot of work, a marathon of busyness. I am already looking at what I can cut from the to-do list, scaling back the baking list and thinking about where I can trim back on the decorating. I look at the calendar and make sure I schedule downtime, movie time, early bedtime. For this week I am deep breathing and sitting and contemplating. I am focusing on how I want to feel over the next month, not what I want/need to accomplish. I remind myself that I need to enjoy the process. There is no sense in baking/wrapping/decorating if I am hating doing it. I need to keep things manageable. I need to take care of myself. You need to take care of yourself too. Take some time this week to remember what is important to you. And keep that in your thoughts as you shop, cook, wrap and decorate. Happy last week of November everyone! 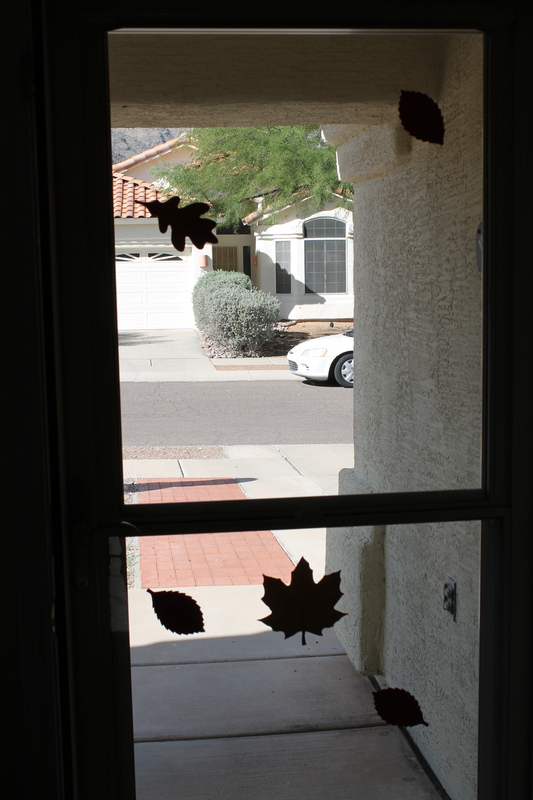 …leaf garlands does it take to make a house look autumnal in the desert southwest? Let’s start with the kitchen, one above each window and two under the cabinets. Two in the family room. One in the dining room. One at the top of my bedroom closet. 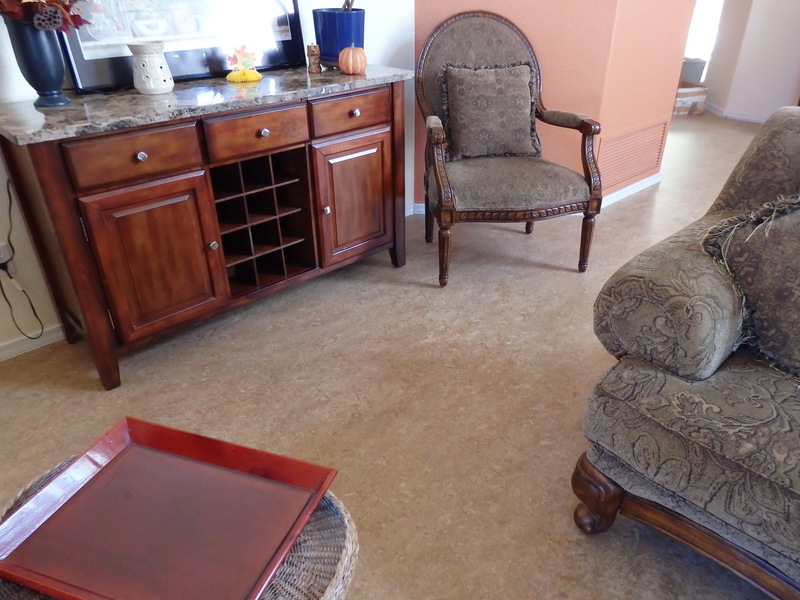 And two in the upstairs hallway overlooking the living/dining room. 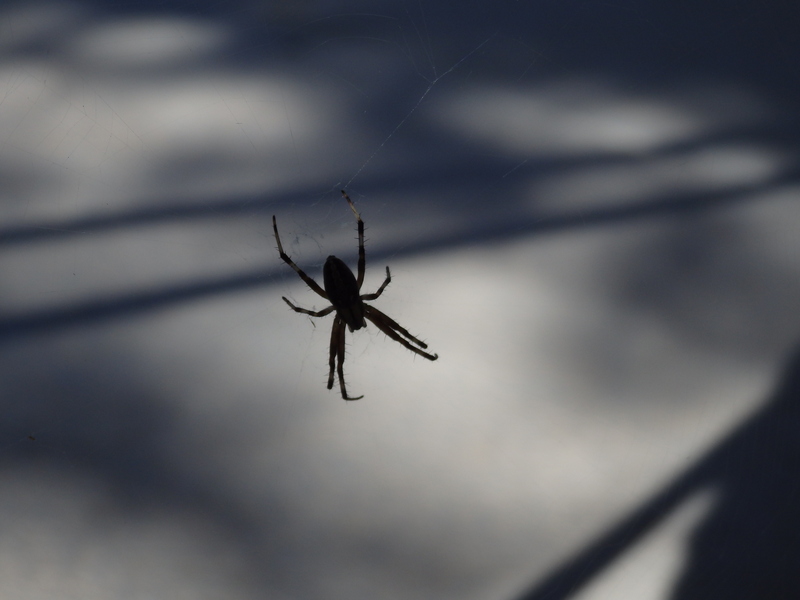 And one in front of my south facing office window that would be really hard to take a picture of. That makes a grand total of eleven. 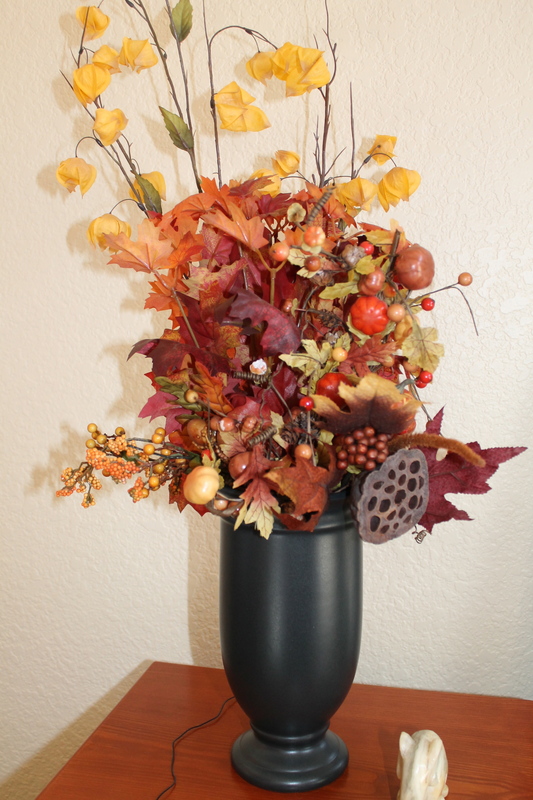 So the answer is it takes eleven leaf garlands to bring autumn to the southwest. Outside, Autumn won’t arrive here for awhile yet. But inside…. Sign I hung on my office door. 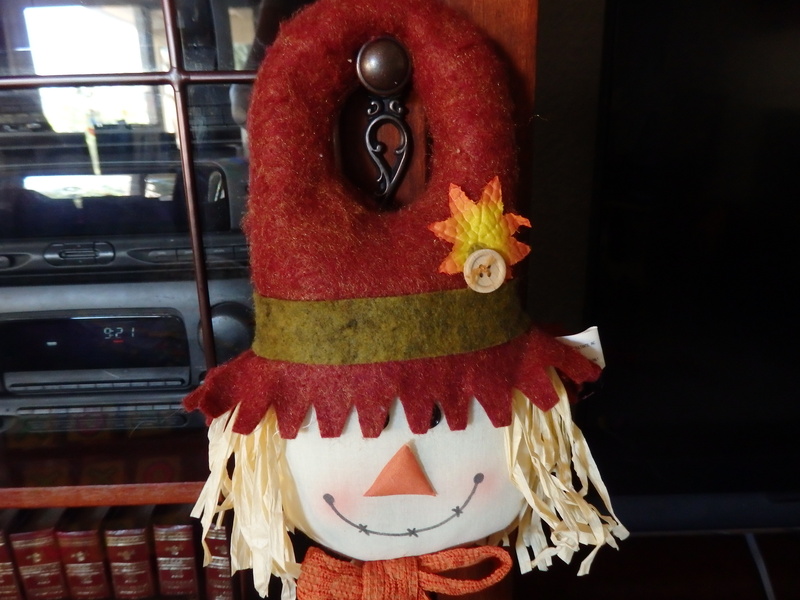 The scarecrow head says “hello”. Yes, my inside fall does make me happy. I hung this on the kitchen pantry door this year. Picture I colored to put in my son’s lunch on Friday. I am impatient for autumn. I am always impatient for autumn. Hands down it is my favorite season. Even with Christmas looming I always feel a bit of a pang when I take all those colorful leaves down and pack up the pumpkins. I also feel a bit off kilter this time of year. It is August, it is hot, it is very much still summer. But school has been in session a few weeks now. That is supposed to mean autumn is peeking around the corner. There should be a hint of frost in the early morning air, a crispness. But it will remain shorts weather well into October and some years even November. My poor brain has a hard time coping with this. I seem to be doing a fair amount of on-line shopping lately. A replacement for snacking? (I hope not!) I look at my purchases and realize I am looking for autumn. I am excited to be getting ready for my son’s birthday and the upcoming holidays. And by holidays I mean Halloween and Thanksgiving. I have bought pajamas for my son for both holidays. It can be hard to find Thanksgiving jammies which baffles me. What are you supposed to wear while watching the parade and eating pancakes? I have been buying fun Halloween candy, Ghost Poofs, how cool! A Halloween game and Halloween stampers for prizes at school. Okay, yes I also bought a set of stamps for my son and I to share. I have also been buying sweaters and long sleeve shirts. What? I know it is crazy. My logic is I am looking for lightweight sweaters/shirts more suited to our pretend winter. And I have been stuck on the color gray for some reason. 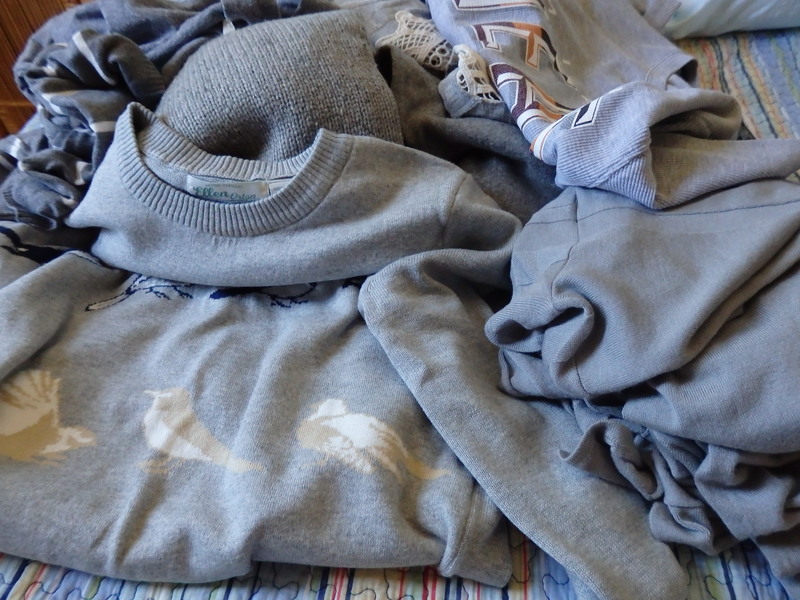 Six gray shirts I have bought this year. Two are for my sports teams, Miami Heat and the Denver Broncos. Now I am ready for January! My favorite find? A lightweight sweater with birds on it from The Vermont Country Store. Perfect fit, feel, super cute and on clearance! I can’t wait to wear it. I know it is illogical but I am hoping for an actual cold winter this year. We had the hottest June and wettest July, is the snowiest January that farfetched? At the very least I want to be able to wear long sleeves (without sweating). I have to add that because I could be one of those people who ignore the actual temperature and dress according to the calendar. Honestly I fear that may happen to me this year. I keep telling myself to be patient. Autumn is still almost a month away according to the calendar. 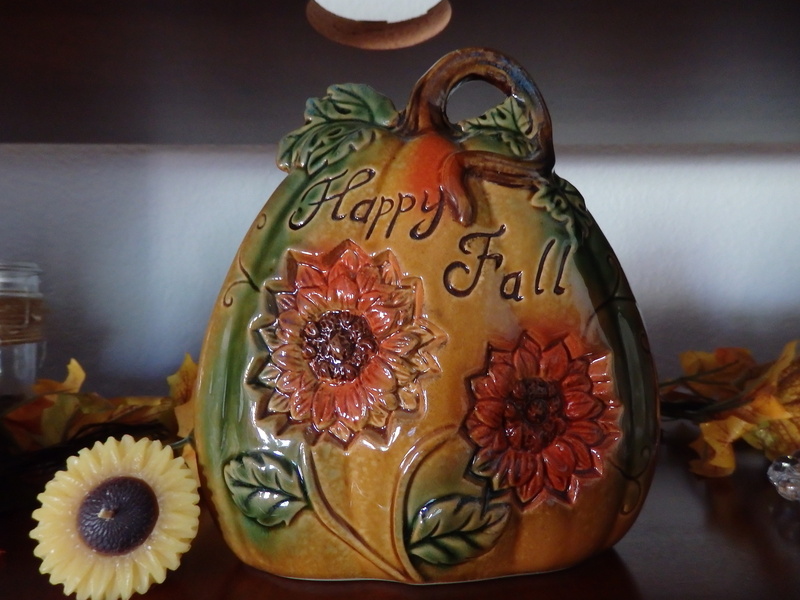 Soon I will be bringing in the autumn totes and decorating away. Soon. I give myself permission to start working with my son to figure out his Halloween costume. (Maybe an elevator, how fun is that!?) 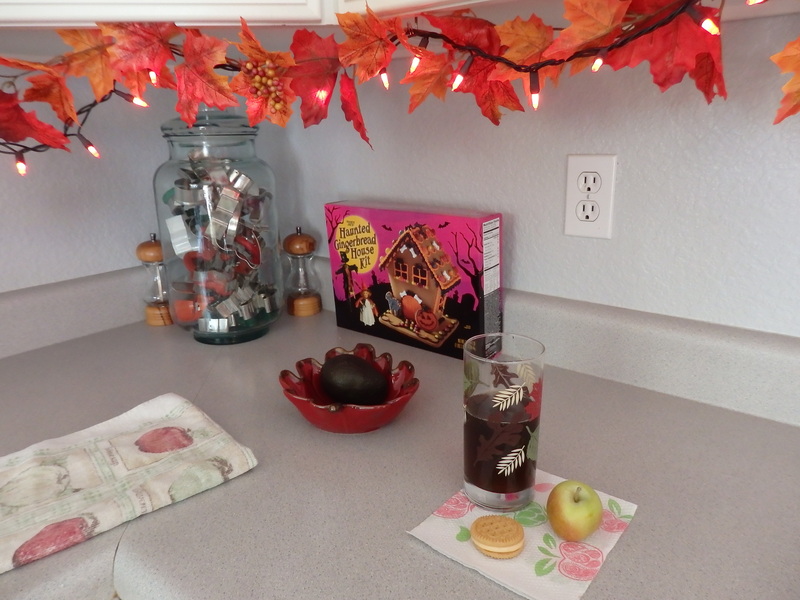 And maybe I take a peek at my Gooseberry Autumn cookbook. And paint my toenails orange. It feels the perfect color to transition from late summer to almost autumn. 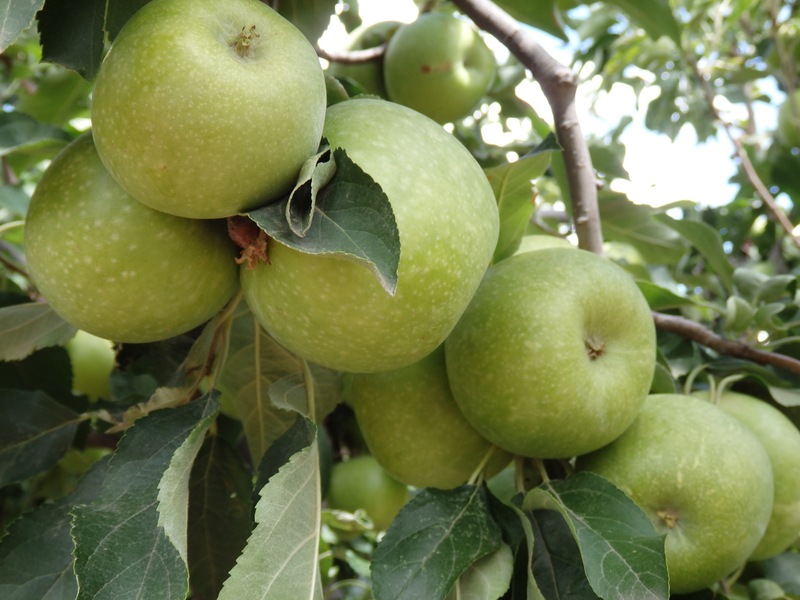 Plan an apple picking trip for Labor Day weekend, yes please. 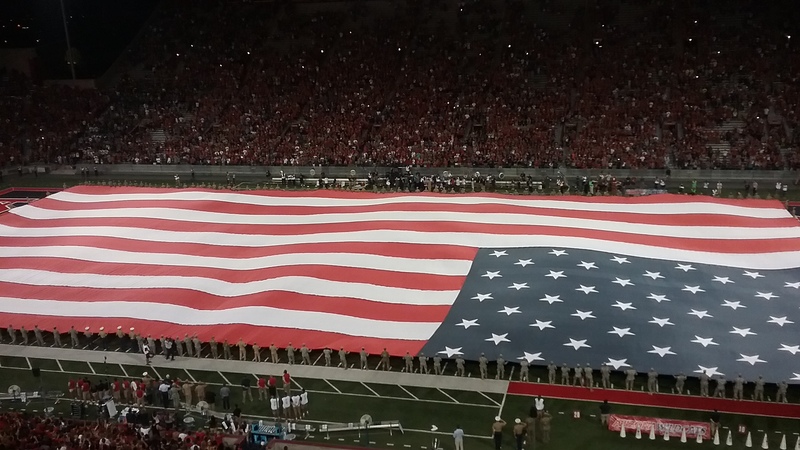 And we have our first U of A football game 2 Sept. Maybe autumn isn’t as far away as it seems. Normally this time of year I get very homesick for a Northeast fall. This year I am focusing on what I do have as opposed to what I don’t. Though the temperature is still well into the 90’s during the day I have been able to make it feel like autumn (at least inside my head). There is a hint of coolness in the morning and evenings, enough so that I have resumed taking the dog on longer walks. This has led me to find some autumn color, desert style. 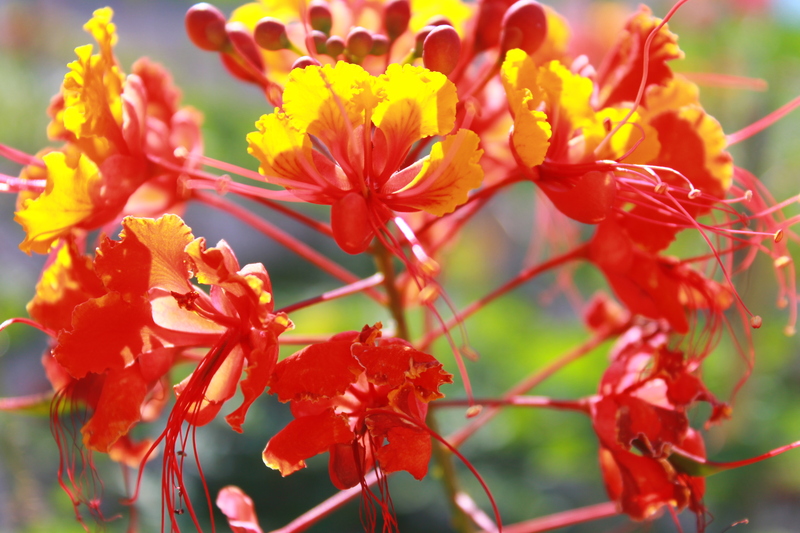 Beautiful reds, oranges and yellows! 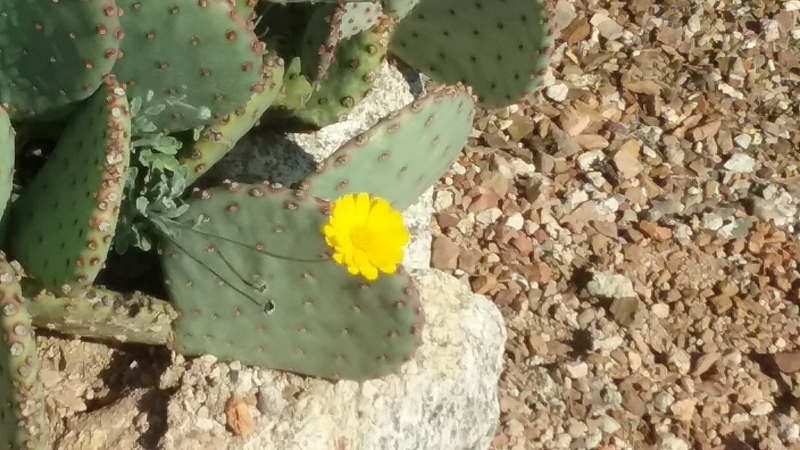 Look at this brave flower squeezing out from under a cactus. 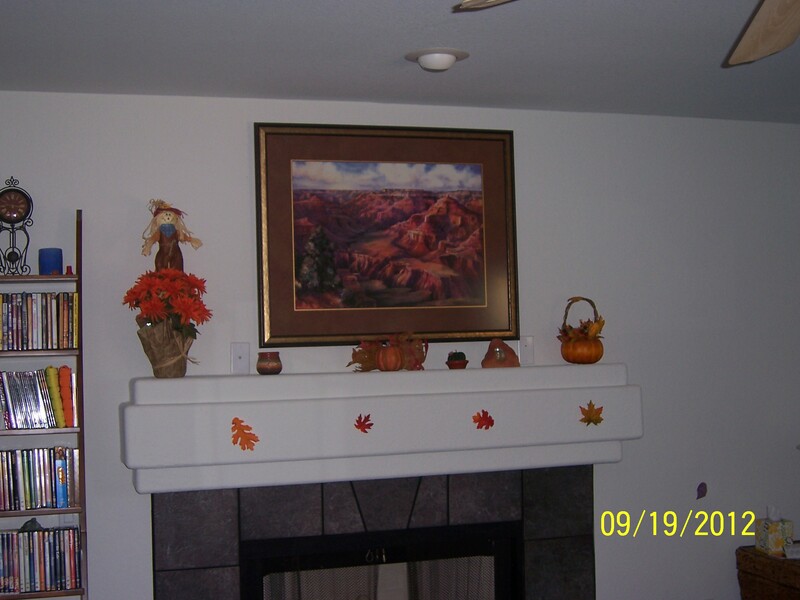 The inside of my house all decorated for autumn. 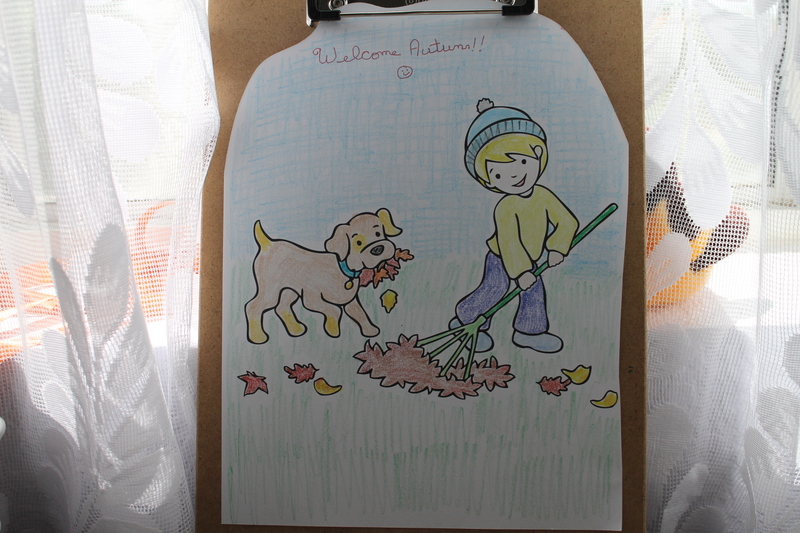 I put leaves like this all over the house, hanging in front of windows and from light fixtures etc. I love how they flutter when the a/c kicks on. 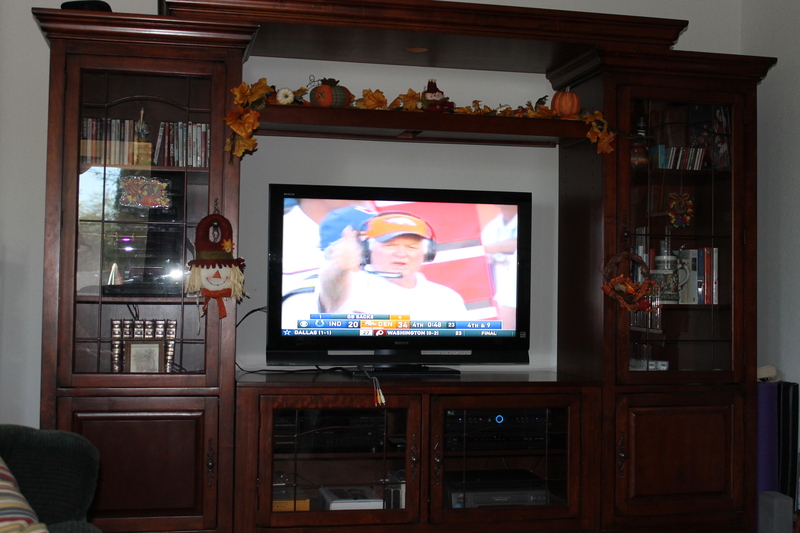 Watching football with a leaf garland and pumpkins in my line of sight! Football season! College marching bands at halftime are the best! Pumpkin chili and pumpkin beef stew made in the crockpot. 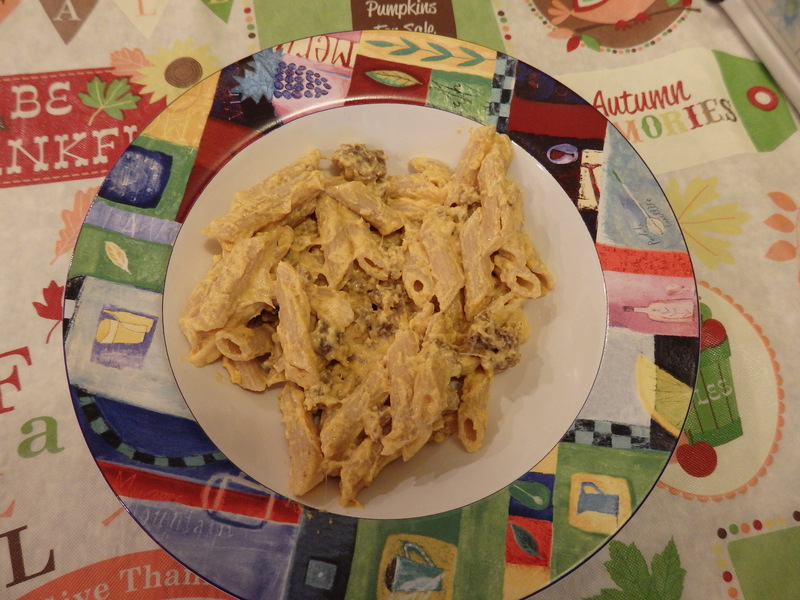 The pumpkin adds a wonderful creamy thick texture. Taking pumpkin oatmeal spice bars to bowling. 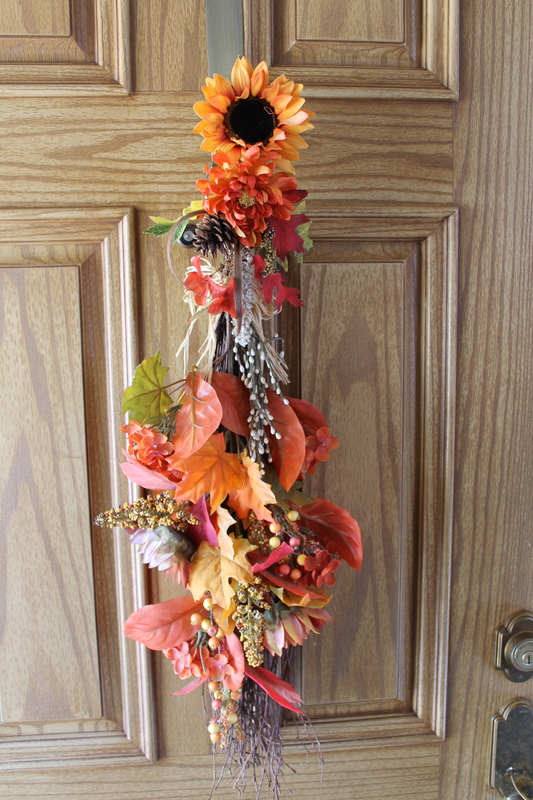 Using wax scents to make my house smell like autumn despite the a/c still being on. Cooking a pork roast in the crockpot also makes a home smell autumnal. 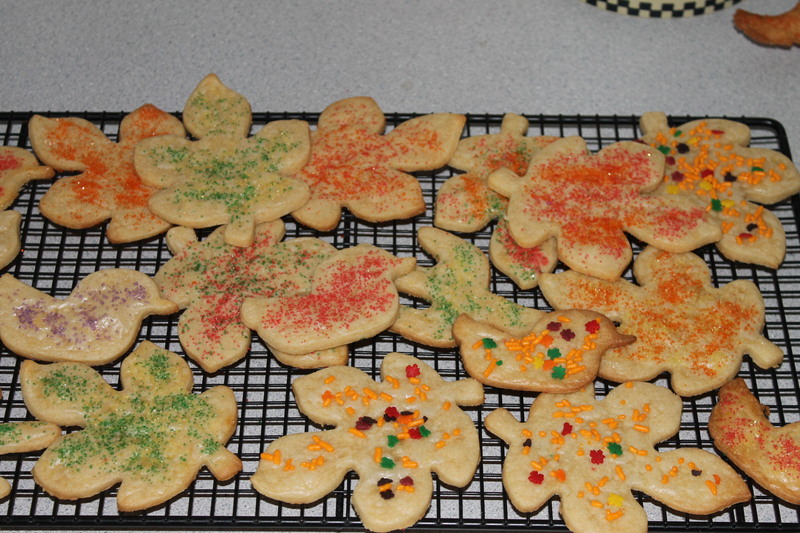 Some promising new cookie recipes that will be on the healthy side but still taste of fall. Working on the outlining of my autumn needlepoint tissue box cover. Adding a Trader Joe’s harvest tea bag to my pitcher of iced tea. Trader Joe’s pumpkin soup crackers, with a bit of cream cheese, crazy yummy! Starting to wear my “fall wardrobe”. Not flannel and sweaters alas, but capris and cropped jeans and autumn colors. I got two new pairs of LL Bean cropped jeans in pale spruce and vintage blue….love them! 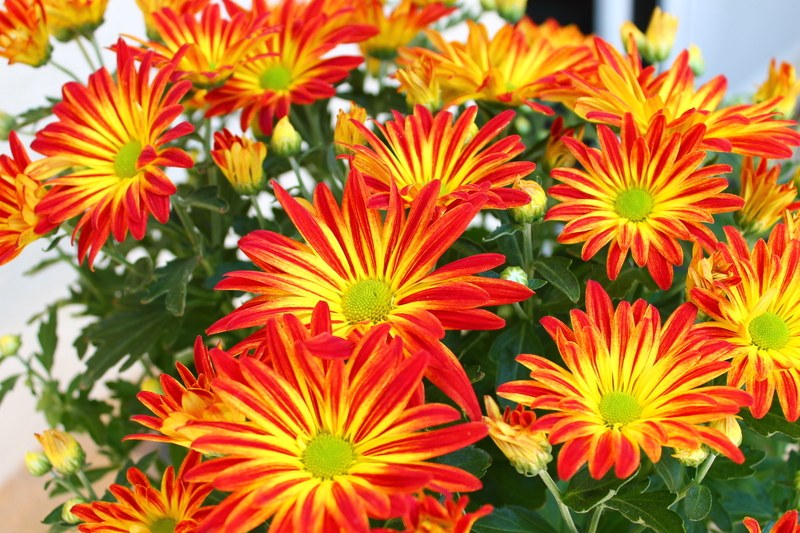 Happy First Day of Autumn!! 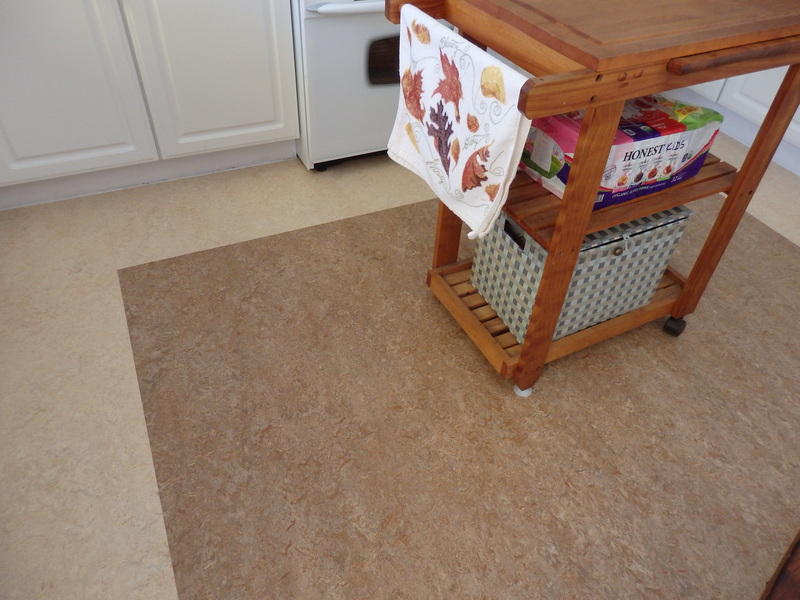 The new flooring with a border in the kitchen. Living room near front door. 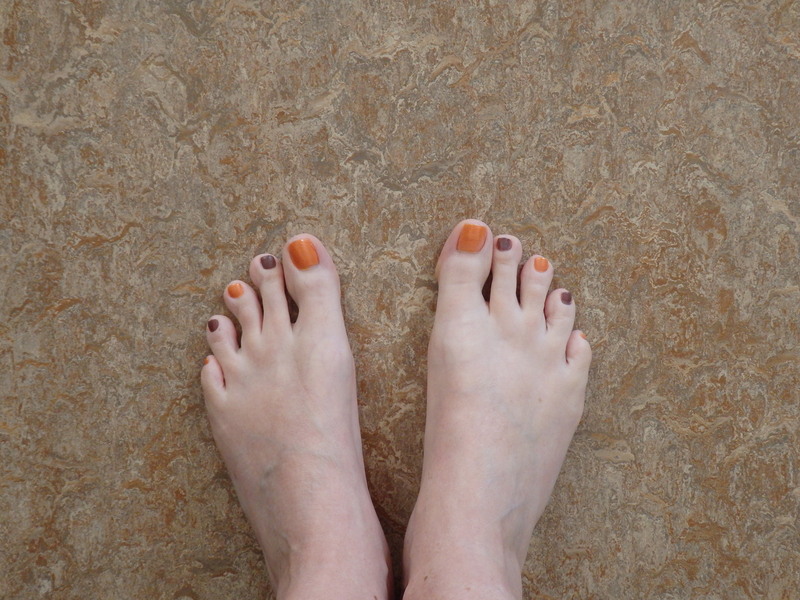 So you can see all the colors in the floor, plus my autumnal toes! I am a persons who needs her alone time. The last three weeks (and next week as well) have given me little opportunity for quiet time to call my own. Without solitude my batteries don’t get recharged. I am feeling very stressed. So much to do it feels like there is not time to simply sit and breathe. My insomnia has kicked in with a vengeance. At least now I am smart enough to recognize the signs but my options for a cure have been limited of late. I need to hold on for another week. I have a multitude of things that have to be done, that can’t be pushed off. But next week at this time I will be camping in the mountains, near a lake, where it will truly be fall. Crisp air, changing leaves, the smell of woodsmoke. It will be worth all the work I have to do beforehand. Now that the flooring is done, the furniture back in place and everything has been cleaned it is time to start carting all the books back downstairs. Seeing all those books stacked in the hallway gave me pause though. I decided to do one more book purge, this time using the KonMari method. When I read the book “the life changing magic of tidying up” I knew there was no way I would ever cart all those books into one place. And yet, pretty much all my books are now in one area! With everything going on I knew I couldn’t do the whole bunch at once so I divvied them up into categories: cookbooks, Library of America, International Collector’s Library, holiday books etc. I am trying to do one category a day, at a time when I can really focus on the task at hand. I am being thoughtful about my choices. I am thinking about who I am now, letting go of past dreams and setting future goals. I’ll let you know how this turns out. I have been able to turn the a/c off for now! I wore jeans one day. 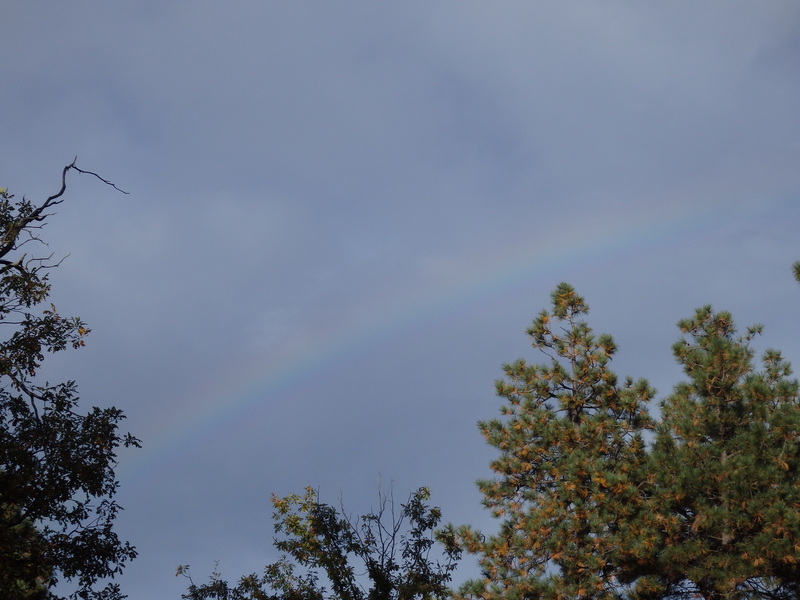 We have had rain, small hail and cloudy days. The relief from the heat is so welcome. Too bad it isn’t going to last. Inside my house it is starting to look like autumn. 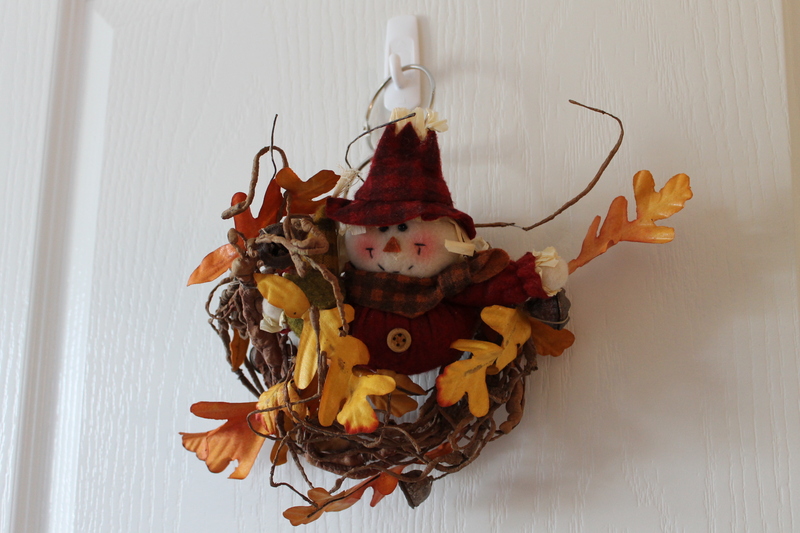 I have put red and orange leaves up everywhere; the irony that I put up leaves while elsewhere they are falling! I have autumn scents in the wax warmers and am eating apples everyday. 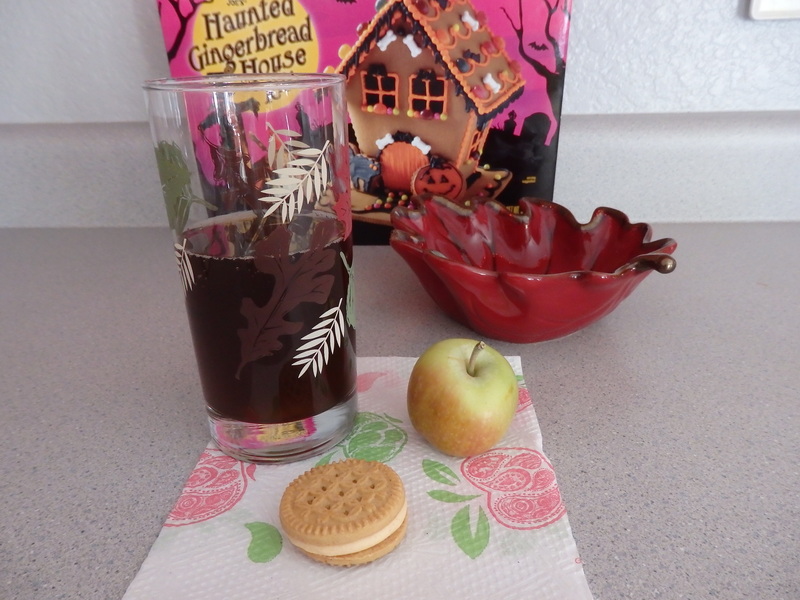 I bought pumpkin everything at Trader Joe’s and while it is still too warm to drink hot tea at least my iced tea is in a fall themed glass. 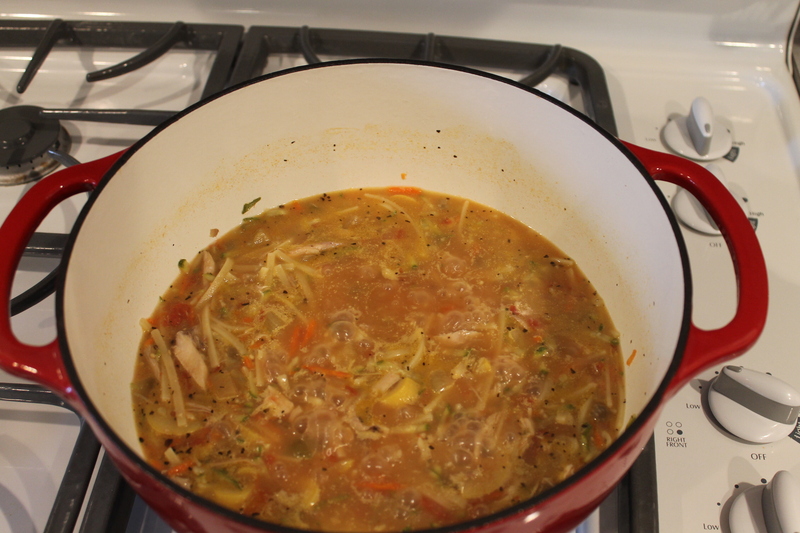 And I have begun making more autumn- ish meals. One night we had cranberried pork chops , glazed acorn squash and yams. Saturday I am throwing an autumn beef stew into the crock pot for after the football game. Of course after sitting under the broiling sun for four hours with temps in the 90s we may not want a hot meal, but dammit after football in October that is what you are supposed to eat! I told my husband we will just have to crank the a/c back up. After school today we are putting up the outside Halloween decorations. 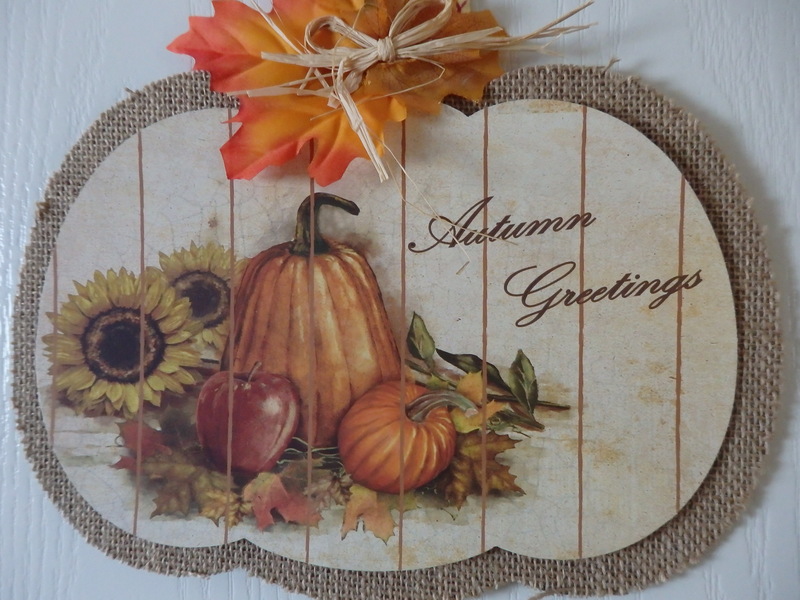 There is a lovely breeze blowing outside along with some clouds blowing around helping to add to the autumn feel. This weekend I have a U of A football game to look forward to and my son’s 8th birthday. But right now I have more books to sort and shelve. 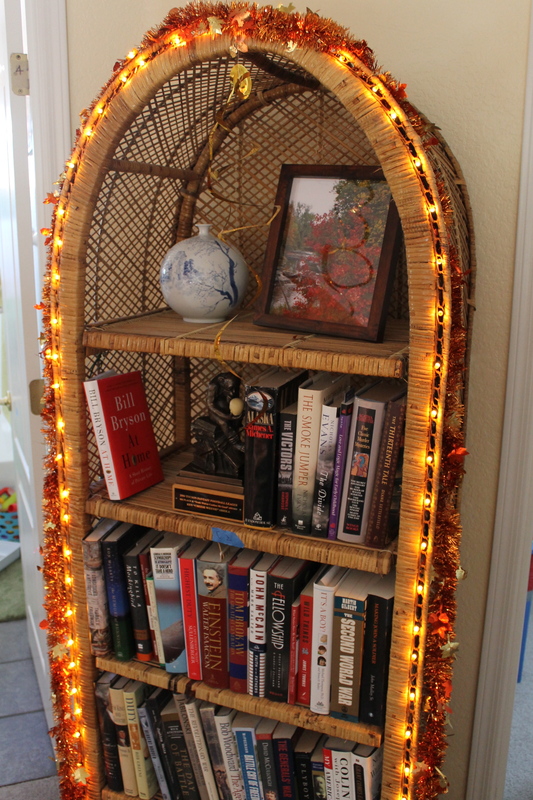 These lights are actually orange and I love how they look with the leaf garland. 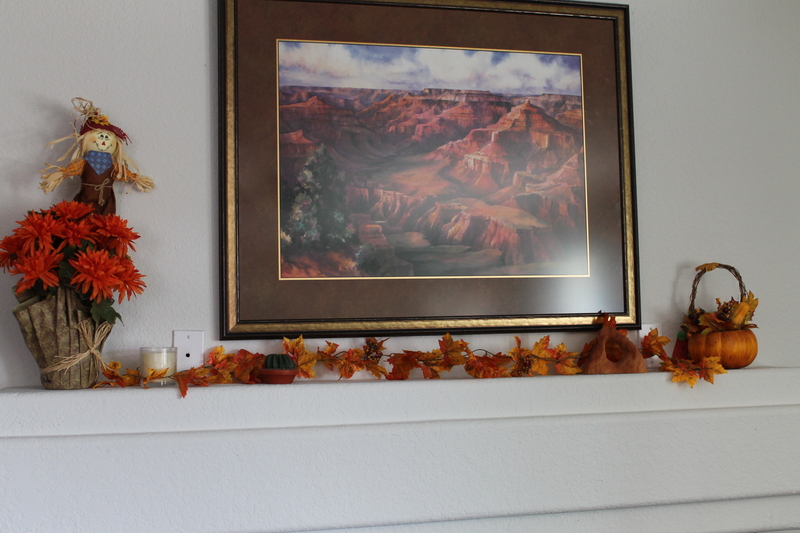 My favorite “autumn spot” in the house. With school starting in early August I am more than ready for it to feel like autumn sometime in September. But it seems like the autumn temps I am used to don’t happen until January around here. By October I am depressed from the heat and the blazing sun. 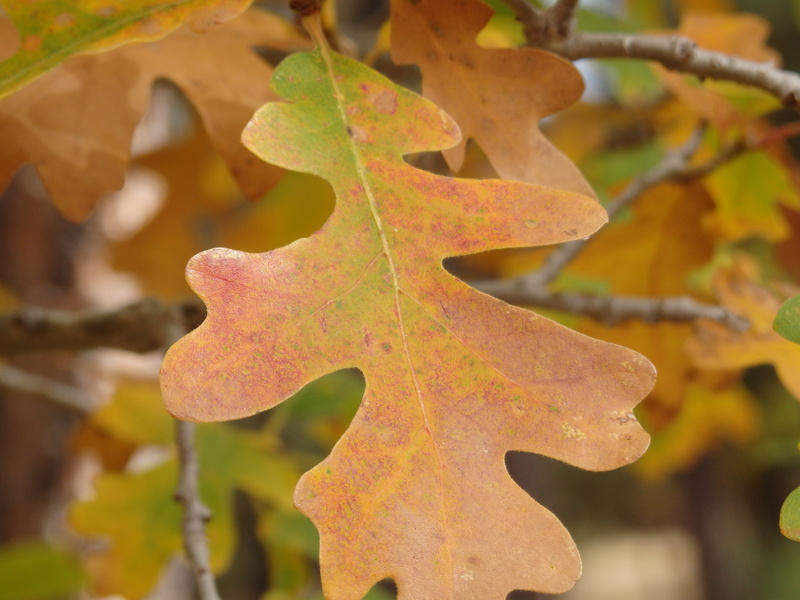 This is my 3rd autumn here and I decided it was time for me to learn some coping skills, see what I can do to create my own autumn and focus on the small, positive changes in the weather here in Tucson. Cooking: I have gone ahead and started cooking like it is cool like fall should be. I have made turkey cutlets with an apple- rosemary glaze, butternut squash and pork tenderloin. 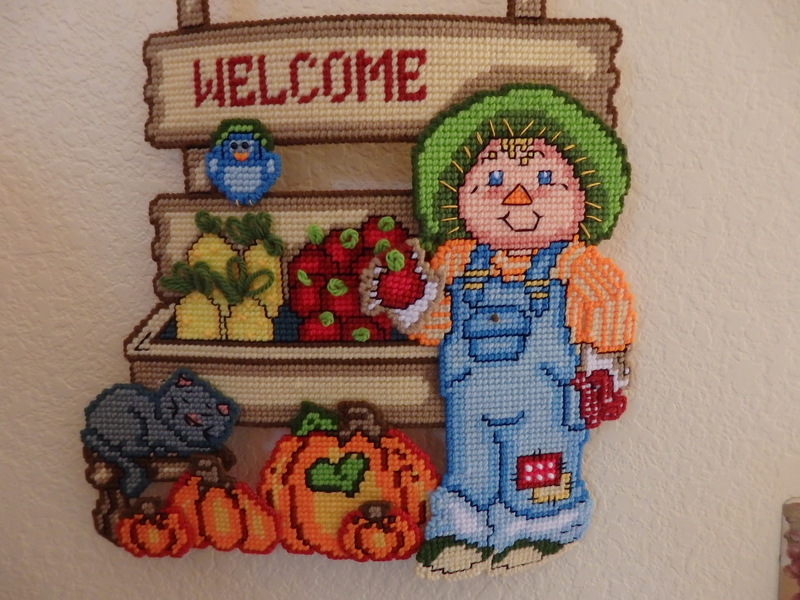 We are lucky to be sort of near (1 ½ hour drive) a farm where we can go and pick fruit and veggies all summer and pumpkins in October (I can’t wait!) We picked lots of apples in August and early September. 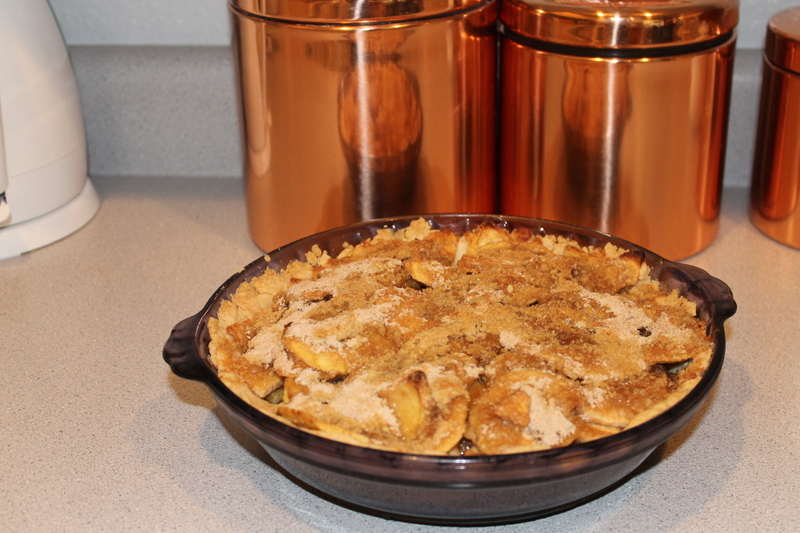 I made crazy yummy apple turnovers and froze an apple pie for around Halloween. 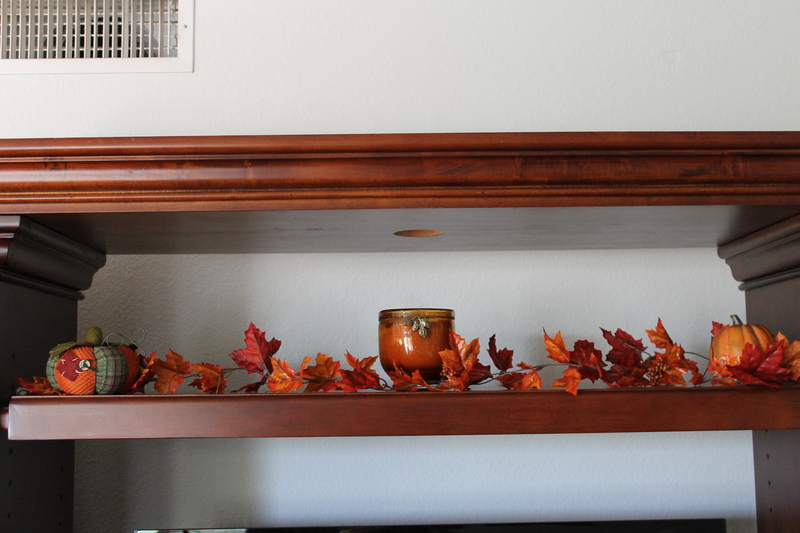 Decorating: There may not be any signs of leaf color outside, but it is busting out inside. Last year I taped silk leaves all over the walls but I didn’t love the look. 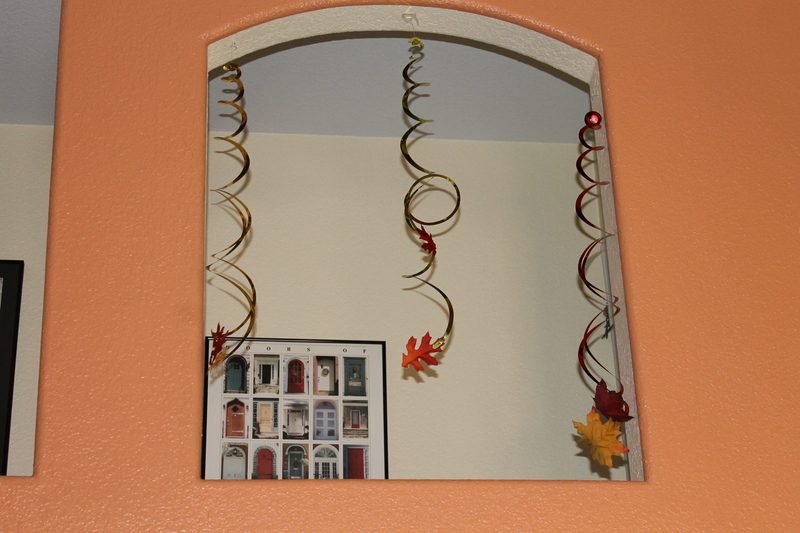 This year I used my leaf garlands in different places and am much happier. Now I have to figure out where to put all those silk leaves. Maybe in a bowl or two somewhere? I also have some apple pie scented wax I melt and sometimes I add a little pumpkin fragrance oil. Definitely feels and smells like autumn inside. Traveling to Autumn: One positive of living here is we can camp year round. We don’t need to winterize our trailer, though if we have a rare below freezing cold snap we do run the heater and try and drain everything we can and keep our fingers crossed. 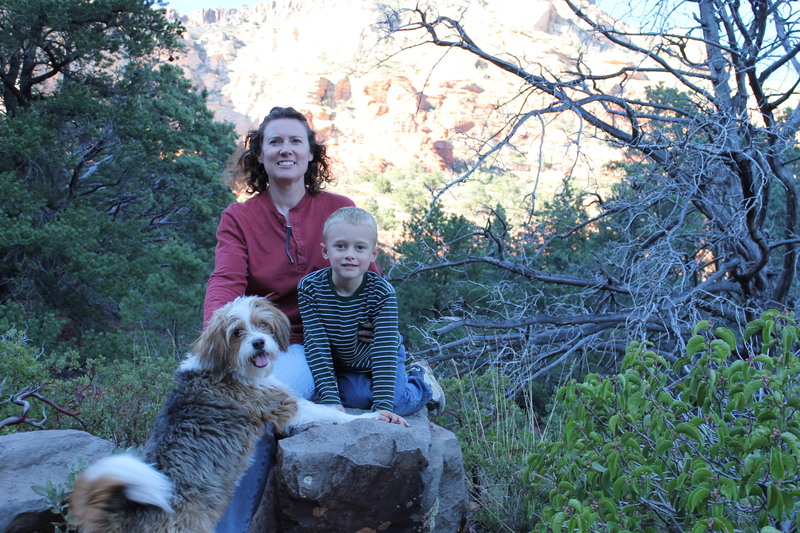 Last year we went to Oak Creek Canyon (near Sedona) in October and Chiricahua National Monument (near Willcox) in November. We got to wear long sleeves and do lots of hiking and eat hearty soups. 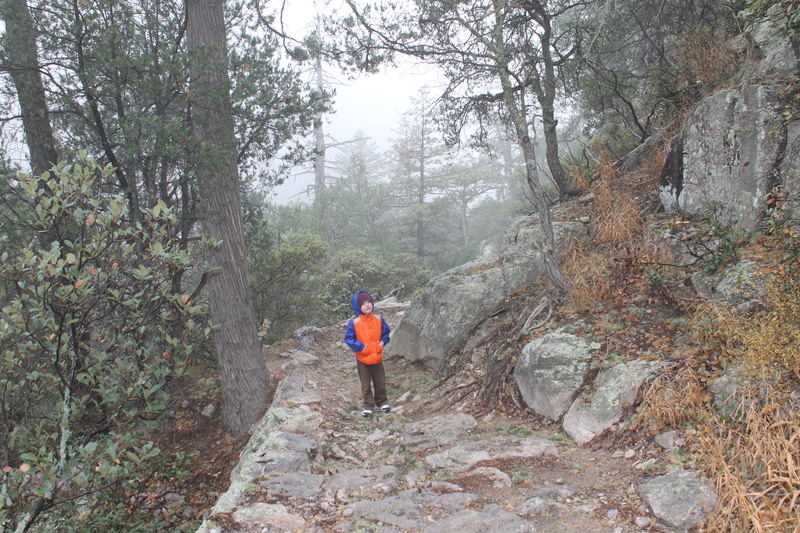 At Chiricahua it was down right cold in the mornings and one very damp foggy day we even saw some snow flurries. I was one happy camper! This year we are going to Dead Horse Ranch State Park (near Cottonwood) in October. 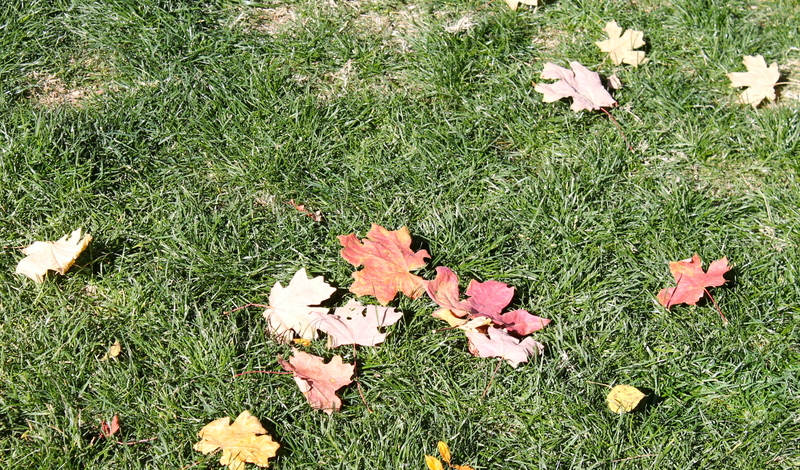 It probably won’t be quite as cool as I would like but we are hoping to see some good leaf color. We are going to ride the Verde Valley Railroad and I am pretty excited about that. No camping plans for November yet. 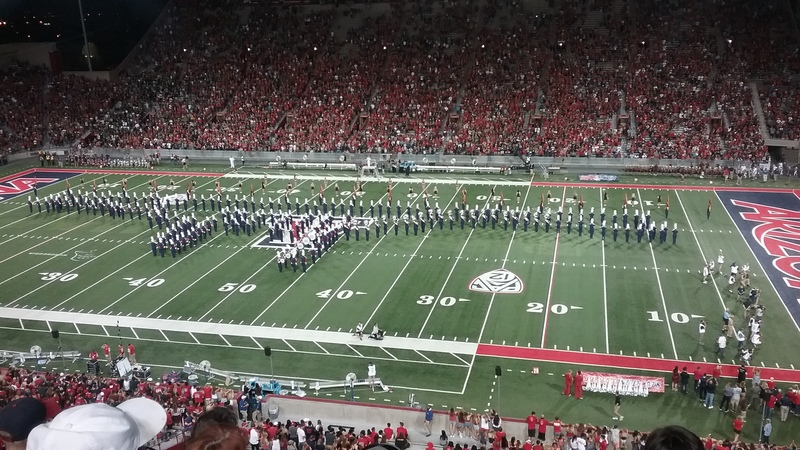 We have tickets to a University of Arizona football game the week before Thanksgiving. 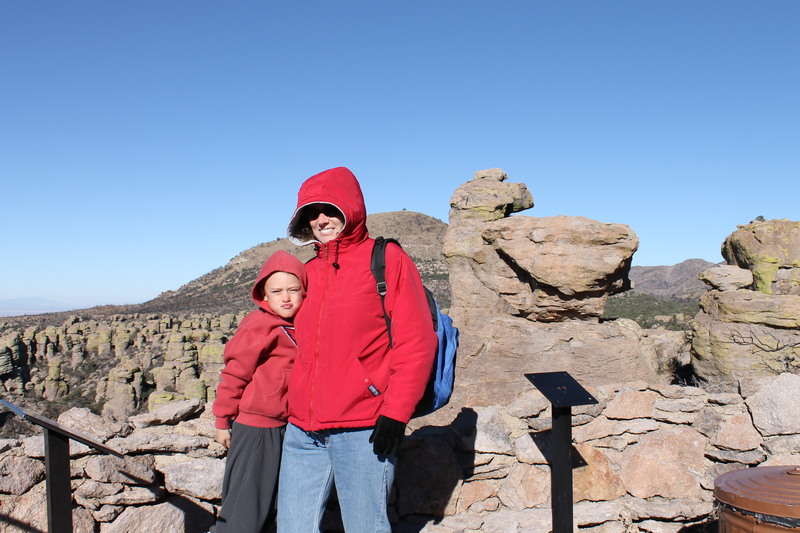 I’d like to go back to Chiricahua for Veteran’s Day weekend but I need to check our schedule. 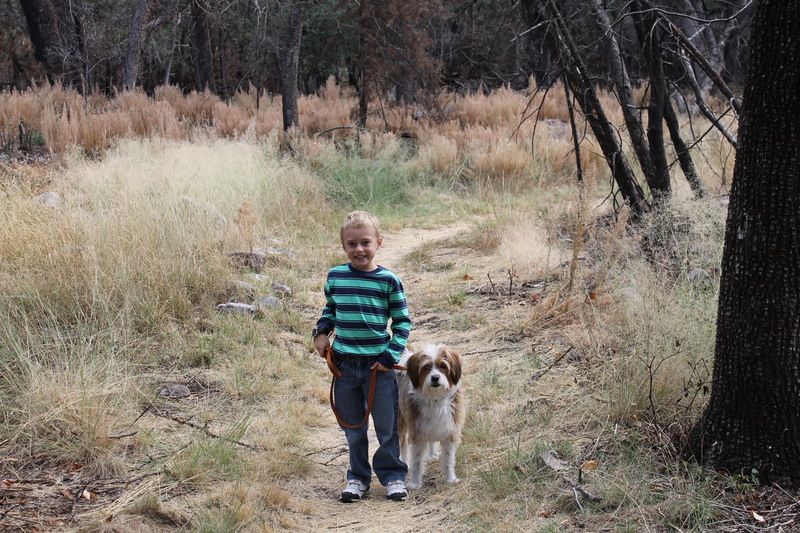 The negative of Chiricahua is they don’t take reservations and the campground is small. 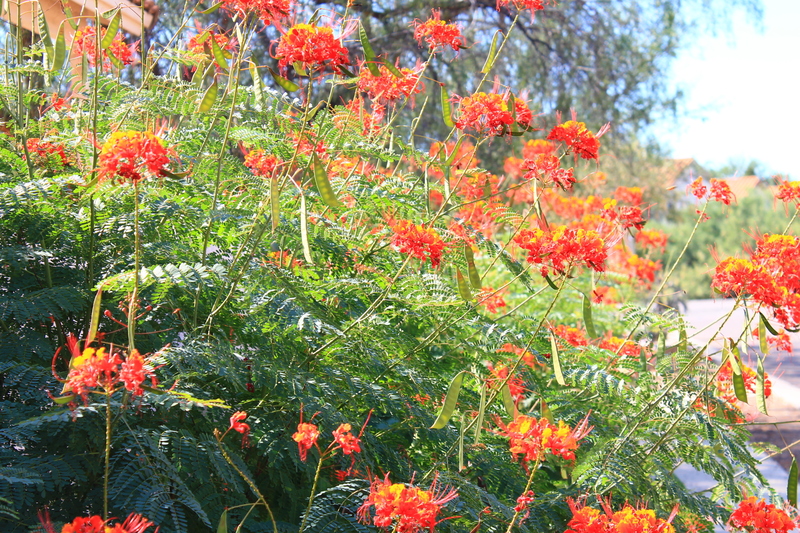 I have one more place to find autumn: Mt Lemmon. We are very lucky to have a nearby mountain with a very nice road to a small village at the top. There are hiking trails, a couple of small restaurants, a gift shop and a ski resort! Crazy I know. And in October the leaves change color up there! 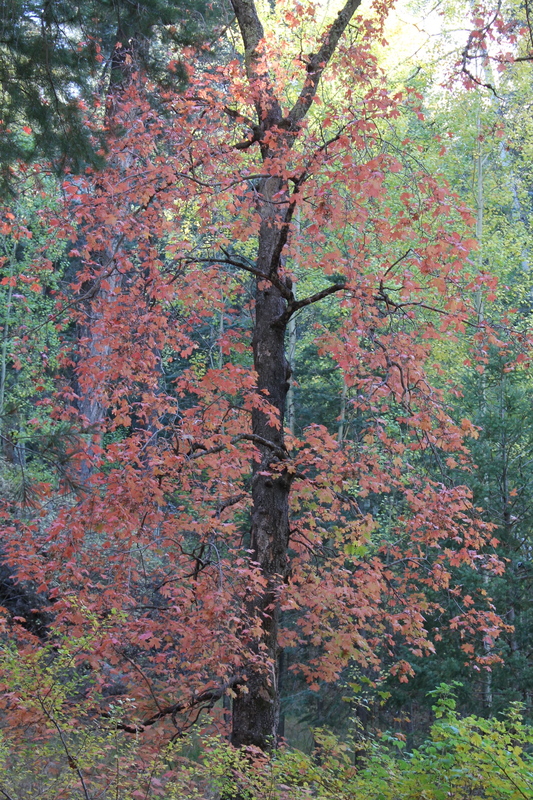 Aspens, a few maples, lots of deciduous trees. It is usually about 10 degrees cooler in Mt. 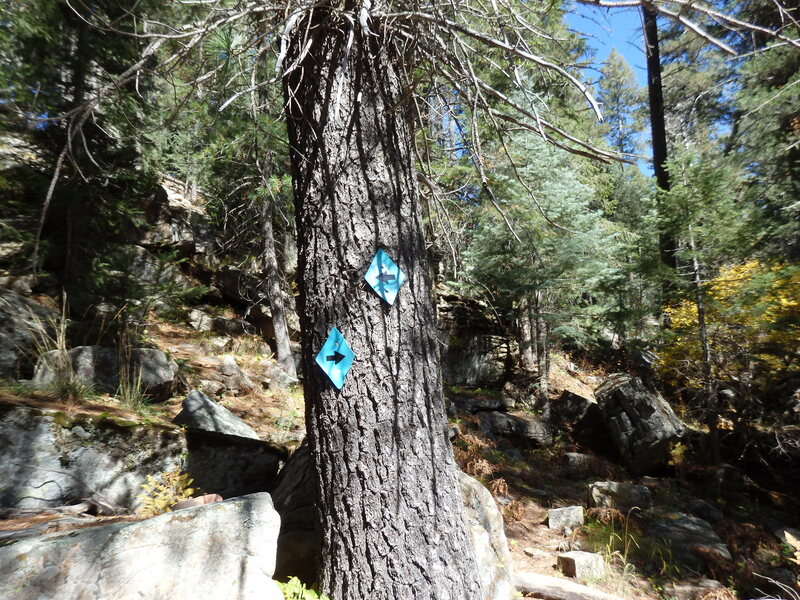 Lemmon than Tucson, so once we hit 80’s here I will be going up to ~8000’ to enjoy the 70’s and gather leaves. Closer to home: While the sun is still blazing down during the day I can see the difference in the evening and morning light. I like the way the sun slants in my office window in the afternoon. Sherlock and I have resumed our post-dinner strolls. While it is hardly sweater weather, or even long pants weather the evenings now are pleasant. I like walking as the shadows lengthen and a hint of nighttime cool emerges. Soon there will be Halloween Decorations to admire in addition to the real bats swooping around and owls hooting. I may not have my ideal autumn, but I have made peace in my heart with where I am and found contentment with this new version of fall.